This exhibition is curated by the director of Charleroi Museum of Photography, Xavier Canonne, aiming at revealing the true colors of René Magritte in his daily life and creative process, through photographic prints and home videos. These two-dimensional images shot between 1914 and 1967 are mostly from private collections without original negatives, discovered approximately 10 years after the artist’s death. The photographs in exhibition here serve as some unique family albums, from the perspective of art history research, unlike documents in the artist’s archives or picture collections of his friends. These images provide an alternative way to explore Magritte’s creative motivation as well as the sense of his works, at the same time they shed light on related development of surrealism in Belgium. Magritte, as ever, is devoted to his paintings, and never for once regards himself as a “photographer.” As historical documents, these images demonstrate the role that photography plays for Magritte and his paintings. They can also be compared with works of the other surrealist artists who make considerable use of photography as means of creation, such as Man Ray, Raoul Ubac, and Jacques-André Boiffard, among others, to see how Magritte relates to and differentiates from them. 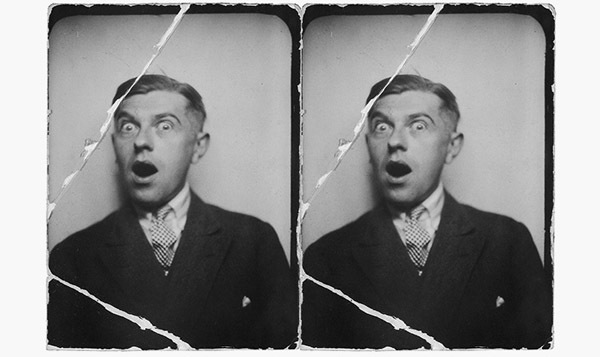 Magritte often turns himself into a comedian improvising in these photos, an image so drastically different from the contemplative and philosophical nature in his paintings. It also shows how an artist readily confronts the caprice of life with good humor in pursuit of truth.